Peter Young's photo was taken on the 16th July 1972 and shows a single decker bus heading along London Road towards the High Street. The remains of the railway bridge behind the bus formed a good canvas for advertisers: two types of cigarette, the cheaper 18p for 20, a Coca Cola advert (many will remember 'It's the real thing'; and finally three adverts for Keep Britain Tidy featuring the celebrities of the day: Steptoe and Son, Dixon (of Dock Green) and Ronnie Corbett. What happened to Keep Britain Tidy? 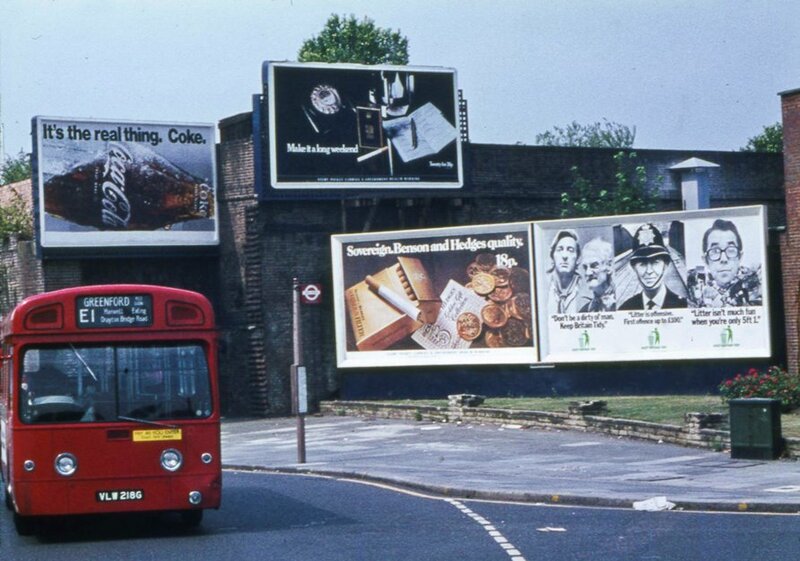 Peter's photos from the 1970s suggests the campaign was working pretty well, just one piece of paper wafting in the gutter; as well as posters KBT used television adverts too. Perhaps they should bring it back. In terms of a more modern view, Dave Stoneleigh's photo from 2008 was taken from a little further away, when the brickwork remained. A look on Google Streetview suggests it has now gone (unless I missed it). A postcard shows a simiar view in 1913.